Harvard university student Mark Zuckerberg sets up a social networking site called ‘The Facebook’, which basically becomes an overnight success and makes Zuckerberg the youngest billionaire in modern times. Meanwhile, a trio of well-off jocks who claim he stole their idea pursue Zuckerberg in court. 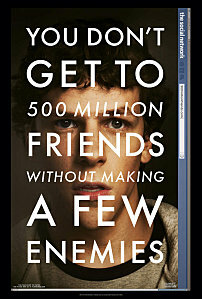 Zuckerberg is played by actor Jesse Eisenberg who is amazing as an emotionally isolated, social-climbing outsider who’s also a genius. Justin Timberlake plays Napster founder Sean Parker with seductive style, taking Zuckerberg from amateur to pro. Director David Fincher (Fight Club, Seven) helms with a restrained and controlled hand that keeps cohesive this tense story of five individuals ironically torn apart by the biggest social networking site the world has ever seen. Screenwriter Aaron Sorkin (West Wing and A Few Good Men) writes dialogue that is fast and intelligent. And finally, the acting, particularly by Eisenberg and Timberlake, is great. A suspenseful, interesting and relevant film.